We are not your average carpet store. 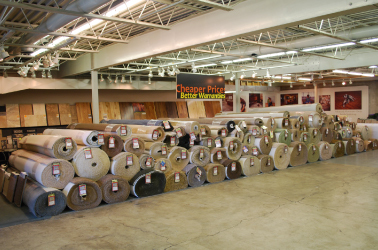 Unlike most flooring stores, you have a huge selection in-stock to choose from. You can actually see, feel, and touch the rolls in the store. No need to select an entire house of carpet from a 3″ x 3″ swatch! You’ll find exactly what you want for immediate installation! We are a legitimate Discount Flooring Store! We buy close-outs, discontinued products, and more. We travel to the carpet sources and hand-select carpets for our store. We buy at a significant savings and pass it along to you. You are GUARANTEED to save money! We have carpets and other flooring on sale every day. We have Provo’s best carpet deals! We also feature many carpet remnants. Remnants are what is left of the roll of carpet when it gets very small. We discount the rolls and pass the savings on to you! Buy your Carpet For Less!! We are in an out-of-the-way location with low overhead. Lower overhead means lower costs as we pass the savings along to you! You can find cheap carpets, carpets at a tremendous discount, clearance carpets, and everything in between! Why pay more for your carpet.